Creativity can be a means of making a significant social contribution or can become a very personal addition to our life satisfaction. 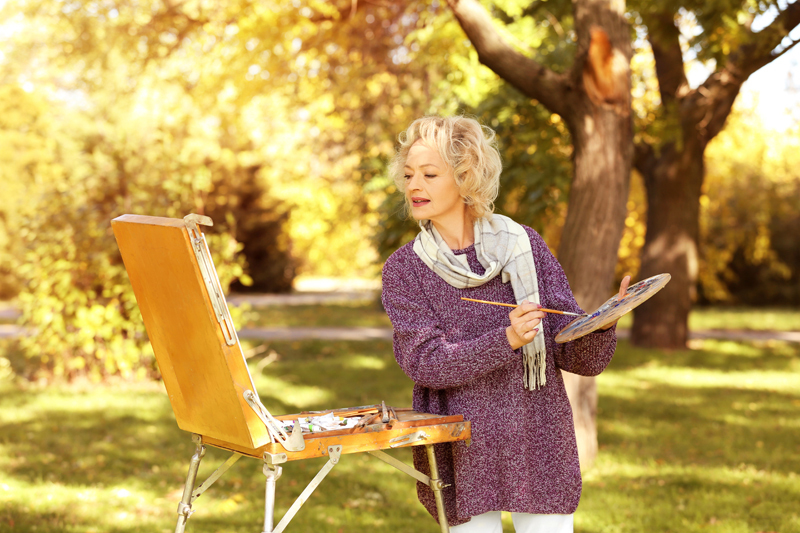 Learn how to enhance our later years by tapping into our creative side. Driving is one of the key factors to independence as we age. Since accidents are more likely to be fatal for older drivers, it is important that we seek out the options available to make our driving safer. Find out more keys to safety here. Learn the warning signs while exercising - when pushing too hard and when to call the doctor. We need to be careful and safe while we are making efforts to improve our health. Home modifications for aging in place (staying in your home in older age) means planning ahead. Studies show that most homes are not designed to accommodate the needs of people over age 65. Learn what to look for and how to make your home more user-friendly as you (and your family members) age. Sometimes small improvements around our home can make a huge difference in our safety. Learn how to be action oriented and feel safer within and outside of your immediate home environment. Taking steps to make our indoors as safe as possible is a smart move as we age. Learn about ways to make our home environments safer and how to help ourselves and others by assessing in-home risks. Many older persons love to travel but they make their plans as they did when they were younger, without "thinking it through." We forget that we may need different shoes, get our medications refilled , and more. Take a look at what we need to make our next trip safe and comfortable. Planning for "what ifs" seems to many of us to be a waste of time. But serious storms are constant reminders of how quickly our normal living can be disrupted. Research tells us that emergency planning should be one of our priorities, especially if we are older adults. Learn the basics here! Many of us realize that lightening can be dangerous -- but we aren’t necessarily aware of the impact thunderstorms have on our overall health. Researchers have reported that thunderstorms can affect arthritis, outbreaks of asthma, and increase problems with sleep apnea. Read all about it!! As older adults we tend to produce less body heat and it is harder for us to judge the colder temperatures. We need to prepare for when we will be outdoors in colder weather and when we are driving. This article will give you some great ideas for staying safe in colder climes. This content was written by . If you wish to use this content in any manner, you need written permission. Contact Patricia Villani, MPA, PhD for details. The Geriatrics Forum invites Site participants to discuss topics of interest, learn more about quality aging, provide feedback on the site, and connect with others with common interests. Subscribe for free weekly updates from this Geriatrics site.